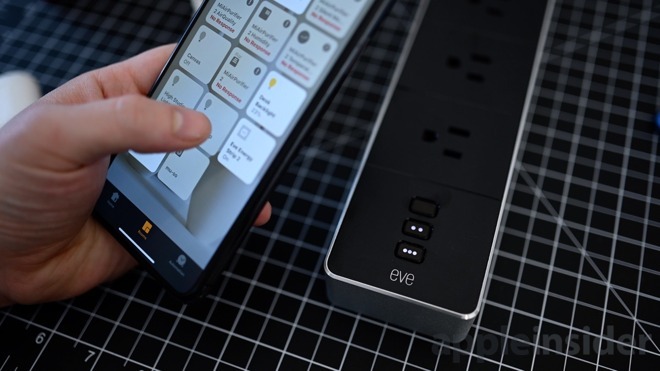 We've seen a few other HomeKit-equipped power strips out there on the market, but none quite like the Eve Energy Strip. Start with the design —it is encased in aluminum with a matte black top. This looks modern, sleek, and in keeping with the rest of the (recent) Eve Systems lineup. It should easily fit into many homes aesthetics without issue. In our opinion, this is one of the best-looking power strips around. One side of the Eve Energy Strip is a small round button, used to reset the fuse should it ever trip. On the back are two mounting holes to tuck this under a desk or against a wall. A HomeKit pairing code is also located here for pairing with the Home app. On the top, you'll find three more buttons, three corresponding outlets, and two status LEDs. Each of the three buttons will toggle one of the three outlets on or off. 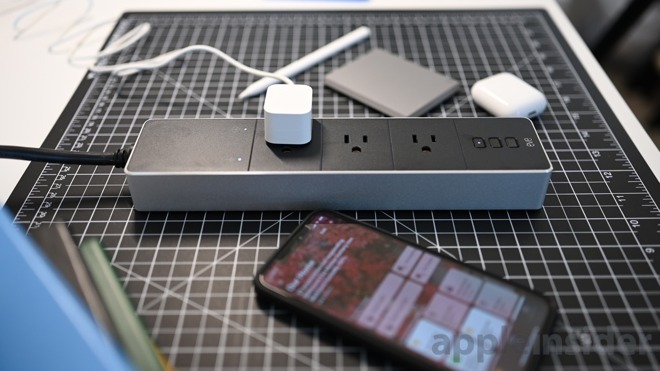 This gives you a physical point to turn the outlets off individually as well as through HomeKit. If you don't want the buttons to work, a child lock feature is available in the Eve app to disable them. The name Eve "Energy Strip" is a bit of a misnomer, and what you get isn't generally associated with a normal "power strip." 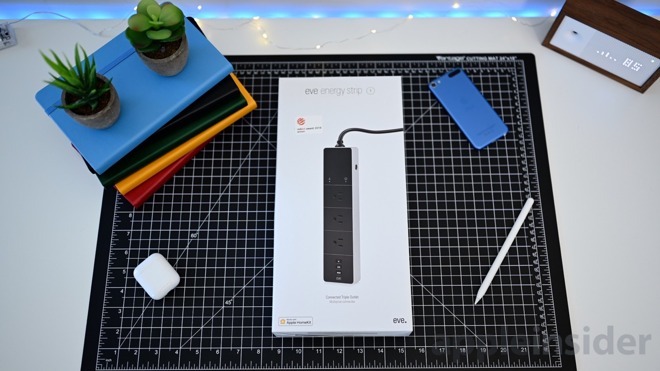 Power strips generally offer no protection for the devices connected as a surge protector does, which is more like what the Eve Energy Strip delivers. It has overvoltage, overcurrent, and surge protection to ensure all of your sensitive equipment that is plugged in stays safe. In the Home app, you can name each of the three outlets, assign them all to a room, denote them as a light/fan/outlet, and designate them as favorites during setup. Once set up they can be individually toggled. Eve decided for this product they were going to use Wi-Fi, rather than their go-to Bluetooth. Bluetooth is fairly quick, and Apple has improved it, but Wi-Fi was still faster. Since this is going to be commonly used for real, functional lightning, Eve wanted no delay in getting the lights to kick in. In our testing, power outlet toggling was very nearly instantaneous when we toggled the outlets. Once configured, the outlets can be controlled from the app, through Siri, through your Mac, Apple TV, Apple Watch, etc. Users can also trigger them based on motion from a HomeKit motion sensor, based on the time of day, based around the sunrise/sunset, tied to switches/buttons, and much more. For us, one of our favorites is to tie them to a wall switch. Take our living room for example —the room was designed with a single wall switch which would turn on the ceiling-mounting fixture. But, this light alone wasn't enough for the room, so we supplemented it with additional floor lamps. Instead of turning all of these on/off separately, we turned to HomeKit. We swapped out the wall switch for the Eve Light Switch and hooked the floor lamps up to the Eve Energy Strip. 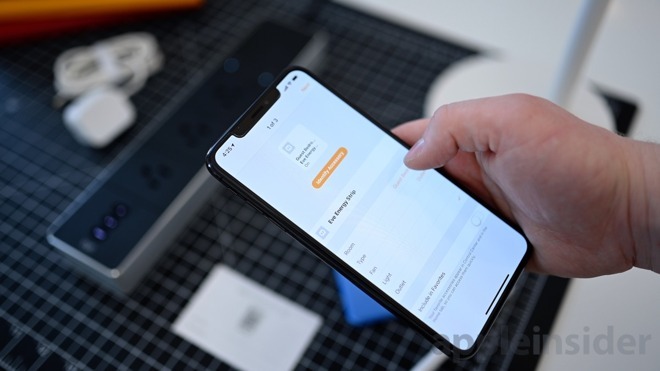 Then, for the ceiling fixture, we created rules in the Home app that whenever the switch was turned on, the Eve Energy Strip would also turn on the outlets connected to the lamps. With this setup, lights can be controlled with a wall switch, as well as through HomeKit and everyone benefits. Apple's Home app is adequate but there are limitations. Especially when it comes to the Eve Energy Strip. For starters, firmware updates can still not be completed through Apple's Home app. It may alert you to the firmware availability, but it won't let you install them. So to do so, you have to jump to the Eve app and tap on the device. Another feature that doesn't exist in the Home app is energy monitoring. Eve Energy Strip not only controls and protects your gear, but lets you monitor how much electricity it is using and what that costs you. From the Eve app, you can view which outlets are in use and how much power they are drawing this second. That will also give you a projected cost based on your location. Further, you can view past energy usage and what it has already cost you. You may never use your Eve Energy Strip to turn your TV on or off, but you may very will be interested in keeping it safe and knowing how much it is costing you to run. The "vampire power" that a television draws can be notable, and a practical demonstration of how much a piece of gear draws when "off" can be startling. Eve Energy Strip is what the smart home should be all about. This is a functional, and beautiful product that doesn't just stick in Bluetooth or Wi-Fi for the sake of it. It does so for a reason and gives you something that looks great, protects your investments, offers an outlook on usage/cost, and lets you control them when necessary. It does all of that and does them well. 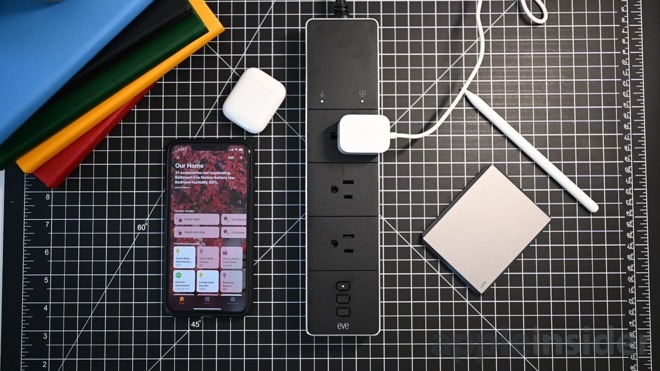 Other "smart" power strips are plastic, nonprotective, and tied in to five other smart assistants. Eve Systems focuses solely on Apple HomeKit. Aside from devoting more time to the Apple ecosystem, it also helps your privacy. All of your data and usage live only with you. Nothing is sent to other servers, nothing is shared with third parties, it is all encrypted within HomeKit. The biggest issue we find with Eve Energy Strip is the limitation of only three outlets. We would love if more could be connected. There is still use here, but we like it so much that we want more. This isn't exclusively an Eve problem, Vocolink, Koogeek, and others have the same issues with their products. If you want to grab an Eve Energy Strip, they are available now for $99.95 from Amazon.